A series of projects that involved researchers at eight universities focused on Wild Blueberries and their cardiovascular benefits. New research, published in The Journal of Cellular Biochemistry, reveals that the unique phenolic acids found in Wild Blueberries speed up the migration of cells that line our blood vessels. 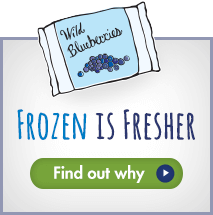 Did you know that incorporating a half cup of frozen Wild Blueberries into your diet each day may help you live longer? Recently, the TODAY Show featured three foods that may increase longevity; rye from Sweden, olives and olive oil from Cyprus, and our favorite superfruit, Wild Blueberries. According to the USDA’s Agricultural Marketing Service sales data, the Commission’s national Wild Blueberry School Foodservice Program increased sales by 57 percent in 2017, expanding from 1.18 million pounds sold in 2016 to 2.78 million pounds sold in 2017. Can Flavonoids Affect Our Kids’ Brains? The Wild Blueberry School Foodservice Program, launched this year by the Wild Blueberry Commission of Maine is quickly – and literally – gaining new ground.